I actually used to have an entire closet devoted to cleaning products in my home! Seriously, I had entire shelves devoted to cleaning products. Stuff to clean the tubs, the floors, the kitchen, etc. Now? I have only a couple of products I use for EVERYTHING. 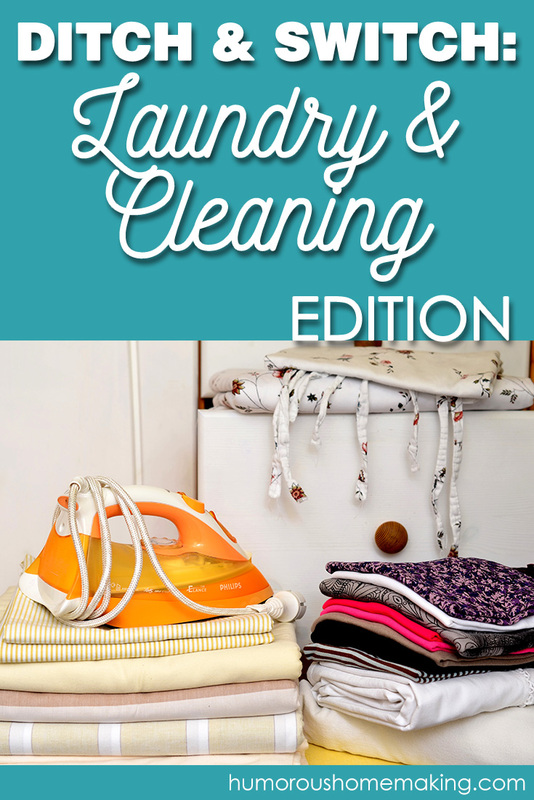 One of the biggest changes we made in our home was to Thieves Laundry Detergent. If you’ve never looked up your laundry detergent on the Think Dirty App, I highly encourage you do it. Especially because of Eli’s sensitive skin – We changed over to Young Living‘s Thieves. At first I was hesitant to buy this detergent because it was very expensive. It wasn’t a change that came easy. Any of y’all who have been following me for a long time know that I started out as couponer. At first, I was hesitant to buy this detergent. I still have the mentality that I wanted to same money and get things super cheap and/or free. Now I have realized that it’s worth it to pay more for products that are healthier and better for my family. It says that this laundry detergent does 64 loads for a little over $20. But it’s 6x concetrated! So it’s actually closer to $10/bottle. That’s not a bad deal at all, y’all. I actually get two bottles of detergent out of one. I went online and found 32 oz. pump bottles, then I pour half of the detergent into the bottle, fill it with distilled water. I know that my washer needs two pumps for an average load, three pumps for a particularly soiled load. That’s it. There are several different healthy ditch and switch options for stain removal. I have found that 4 caps of Thieves Household Cleaner with 16 oz of water makes a very concentrated stain remover. If I get a grease stain, I use Eucalyptus essential oil directly on the stain and let it to sit overnight. Butter stains are gone! I also have learned that Thieves toothpaste works well as a stain remover. But when I have a stubborn stain that I absolutely cannot get out, I use BioKleen Bac-Out to treat the stain overnight. If all else fails, it is totally worth having this product on hand. BioKleen is a clean(er) cleaner and a healthier option than the conventional stain removers you can typically buy from the grocery store. Fabric softener is also a super easy ditch and switch! I put white vinegar in the fabric softener dispenser. I know people who say that this will ruin the seals on your washer, but I have asked a lot of different plumbers and a appliance repair people who say its completely fine. I also add about 4-5 drops of tea tree oil to every sheet and towel load. This gets rid of that funk that sometimes accompanies linens and towels. You can also put Epsom salts in your laundry to work as a fabric softener. One of my friends made me one in an adorable Pioneer Women mason jar. Hers has some essential oils added with the Epsom salts. 1 tablespoon per load really works wonders for your clothes as a natural fabric softener. Household cleaners couldn’t be easier to ditch and switch – all you need is E-Cloth and Thieves Cleaner. These two have literally replaced all the other cleaners in my closet. One cap of Thieves Household Cleaner mixed with 2-3 cups of water, makes one large bottle of cleaner. It ends up being about $1 a bottle for a plant-based, effective cleaner that you can use on absolutely everything. You just cannot beat that, y’all! Check out this post where I share all about how I use Thieves Household Cleaner and E-Cloth for absolutely all of my cleaning needs. Deciding to ditch and switch has made my life so much simpler. And I know you can do this in your home, too. Making one healthy change at a time – something you can stick with – is the best way to do this. Don’t rush! Just take your time and it will all be totally worth it someday. Remember, better done than perfect. 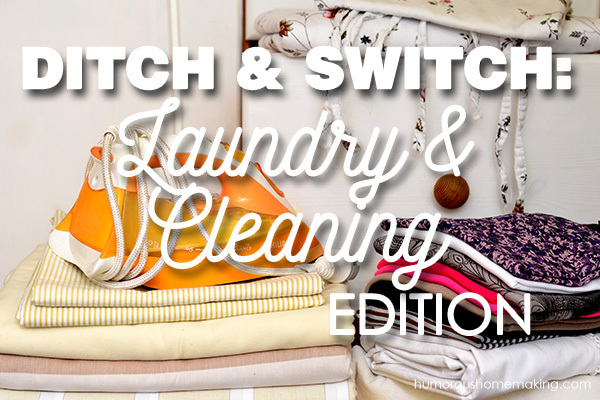 What ditch and switch changes have you made in your laundry and cleaning routine?